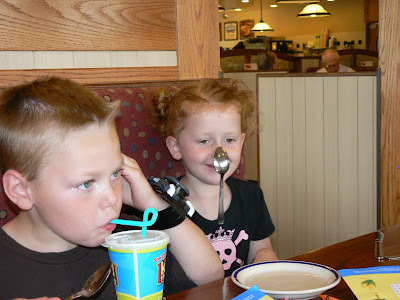 Our family spends way too much time at Bob Evans! I am not sure why? I guess the kids eat there and it is relatively inexpensive! I decided to take my camera out and get some random shots around the table and when my camera met Gina this is what she was doing! Are you kidding me? I asked her where she learned that and she matter of factly said "YoGabbaGabba"! I have heard of Yo Gabba Gabba before but today was the first time I watched it. Is it only me but do they look scary? Yes they do! DJ Lance is from St Louis, so I felt like I should give it a chance. He said they wanted to create a show that was like the Electric Company (remember that one?). Yo Gabba Gabba is a totally weird show!